There are several generic cyclization methods for constraining peptides, such as SS-cyclization or amide cyclizations (head-to-tail, or backbone cyclizations). 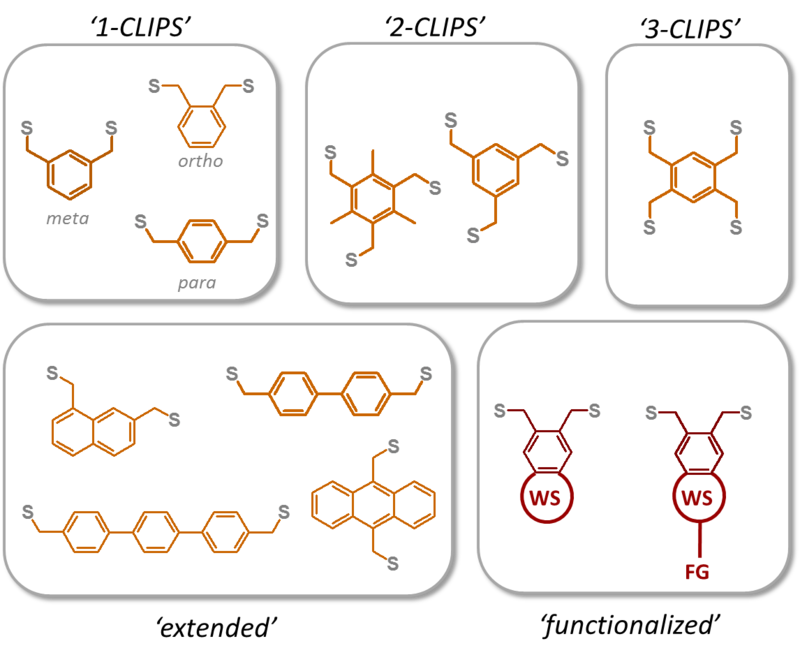 Pepscan has developed a uniquely versatile and broadly applicable technology for constraining the 3D-conformation of peptides, termed CLIPS (Chemical LInkage of Peptides onto Scaffolds). Unlike other constraining methods, CLIPS-chemistry can create mono-, bi- or tri-cyclic formats and is compatible with the presence of side-chain-unprotected amino acids. In addition, CLIPS peptides have proven valuable in a broad diversity of other research applications. Pepscan offers custom CLIPS peptides (from single compounds to large libraries) on a royalty-free, fee-for-service basis. Contact us for more information. CLIPS technology involves the (multiple) cyclization of linear peptides via reaction with a small rigid entity (chemical scaffold) that carries 2, 3 or 4 reactive bromides as anchor points. The anchors react exclusively with the thiols of the cysteines in the peptide and attach to the peptide via multiple covalent bonds. The peptide folds around the scaffold and loses flexibility while adopting a well-defined three-dimensional structure, with the scaffold entity in the center like the “spider in the web”. The better-defined 3D-structure as well as the non-natural covalent thio-ether bonds provide enhanced stability towards degradative enzymes. Pepscan has developed a toolbox of >70 different types of fully synthetic, tailor-made CLIPS scaffolds, varying mainly in size, polarity, rigidity, solubility, functionality, and ‘SS-spanning’ distance. When positioned appropriately within the peptide sequence, the resulting CLIPS peptide resembles the 3D-structure of the corresponding region on the intact protein much better than the linear sequence. The CLIPS-cyclizations can be performed on native L-cysteine residues, but also on artificially introduced D- or L-(homo) cysteines at virtually any desired position in the sequence. Hence, the structure and dimensions of the CLIPSed peptides can be varied at will.